Played in more different world titles than any other player and has won more different types of National titles than any other player culminating in 3 World Titles. 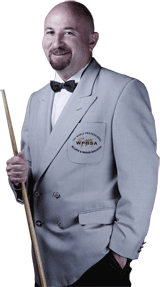 He also has provided television commentary worldwide and is the only player in the modern game to both professional billiards and snooker events. an ‘A ‘ Grade Professional Coach couple with unique number of different National titles will help reach your potential. Group and Individual coaching available. Purchase quality chosen billiard cues and equipment tailored to you needs. Robby Foldvari is a Triple World Champion for Australia and is a professional player who has competed with the world’s best at snooker and billiards. In a career which has spanned over 30 years he has appeared on television many times around the world, sometimes with television audiences of tens of millions of people. Foldvari has visited over 30 countries to compete, coach, perform trick shot exhibitions and provide television commentary. In 1986, Foldvari won the World Professional Billiards Championship making him the only other person from Australia along with Walter Lindrum to win the World Professional Billiards Championship. For this, Foldvari was runner up to Pat Cash in the Herald Caltex Sportsman of the Year Award. Robby’s first cue is at the National Sports Museum within the Melbourne Cricket Ground. Robby has also won a WPBSA sanctioned professional snooker tournament defeating Darren Morgan in the final, 8-1 in Clacton, England. This made Robby the only person in the modern day game to win both WPBSA (Professional) sanctioned Billiards and Snooker Tournaments. Melbourne, Sydney, Brisbane, Adelaide, Perth, Launceston, Hobart, Albury, Wollongong, Gosford, Wagga Wagga, Canberra, Mildura, Shepparton, Geelong, Barwon Heads, Bacchus Marsh, Ballarat, Benalla, Bendigo, Morwell, Newcastle and many more. London, Birmingham, Manchester, Brighton, Edinburgh, Glasgow, Aberdeen, Belfast, Portsmouth, Southampton, Bristol, Clacton, Middleborough, Carlisle, Sheffield, York, Leeds, Aldershot, Reading, Derby and many more. © 2015 World Cuesport Billiard Academy. All Rights Reserved.